I have not written in this blog for more than a year. At some point, the demands of work and family somehow superseded the ability to carve to out the time for a food journal. I’ve been cooking – but I haven’t been cataloging in the way that once characterized how I approached cooking. Life has simply been more rushed lately. But the memories and the meals are with us still. Although I may not be writing as frequently as I once did, you will still find me here from time to time. For those of you who continue to find me and visit, thank you. I would love to hear from you. These days, we are a banana family. L is still eating “na-na” for breakfast every morning, but now she can say the word banana, and has mastered The Name Game song too. Occasionally, our family will eat 2-3 bananas a day, which makes us think that buying bananas in bulk is a good idea. But then we will hit a banana lull and are caught unawares: suddenly, the bananas are speckled with black and everyone has lost interest. My newfound interest in banana bread is propelled by a desire to bake at least one thing well, and by my inability to waste what was yesterday a perfectly good piece of fruit. I finally have made margin notes in the recipe book. And, I have made it several times. And I have gotten it right, more than once! It helps that L loves banana bread. It helps too that she makes it with me now, and mashes the banana with a fork and stirs the batter too. ½ cup grated dried unsweetened coconut. A few notes: The coconut makes this dish all bells and whistles. Otherwise, it’s just a banana bread. Really. You can use up to 5 bananas; otherwise, the batter is a little too dry. A trick to adding moisture: freeze the bananas. When the bananas thaw, they release their juices, which are concentrated and extremely flavorful. I also add a little cinnamon, because I think it makes just about everything taste better. Happy Baking! Make sure the butter is at room temperature and soft. In a separate bowl, cream together the butter and sugar. Mash bananas with glee and abandon. Stir in the nuts, vanilla, and coconut. Add this mixture to the butter and sugar and stir to combine. Stir the wet mixture into the dry ingredients and fold gently, using a fork or a rubber spatula. DO NOT OVERMIX AND DO NOT BEAT, otherwise, the crumb structure will be hard and your banana bread will make an attractive doorstop. Pour the batter into a loaf pan and bake for 45-60 minutes, until gorgeous and browned. 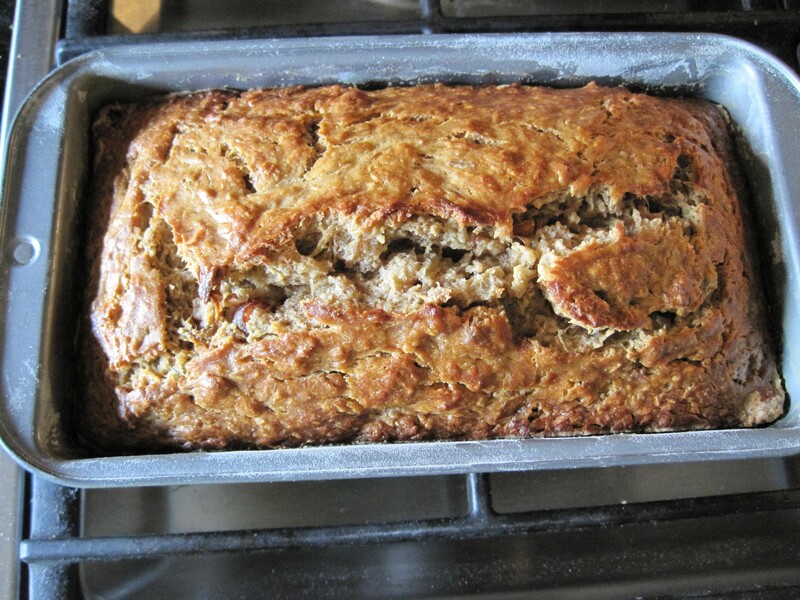 A toothpick comes out fairly clean, but the banana bread will be pretty moist. When cooled, serve with ice cold milk. Sing “banana fanna fo fanana me mi mo manana” at the top of your lungs. 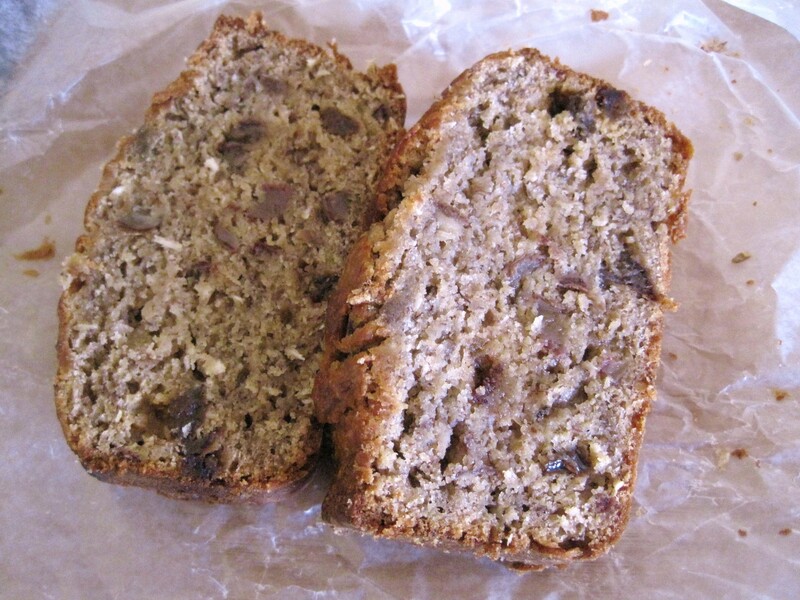 This entry was posted in Dessert, Uncategorized and tagged baking, Banana, banana bread, bread, Coconut. Bookmark the permalink. Thank you! I am not much of a baker but keep trying. Thank you! It actually turned out pretty well. This batch had raisins in it (baking improv moment), which may have been a little too much going on all at once. Thanks for reading!